Down in the valley where berries tangled with old secrets and the moon went to sleep, down in the valley of wild quiet and tree dreams, lived a witch. The townspeople knew she was a witch because they said so. She said nothing back, except a few common words - bread, milk, please, how kind, that sort of thing - when she came to buy her groceries. Half the time she had an expression on her face as if, infuriatingly, she was not even seeing the townspeople, but gazing instead on something else - the devil's tail, perhaps. The other half of the time her eyes seemed to shine, as if tear-filled or enchanted. She was neither young nor old. She looked like a rather plain woman on a purple bicycle that probably turned back into a broom in the valley. A woman with copper-coloured hair and long, patched dresses and a troubling smile. Of course she was a witch. She cut her cats out of the night sky and gave them stars for eyes. 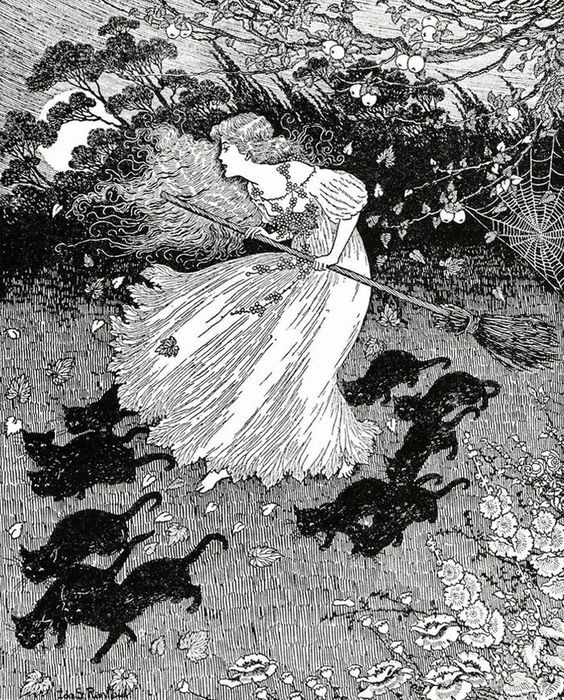 She caught wishes on cobwebs and ate them with her porridge, which was why some folk never married or got the promotion they wanted - the witch was why. That was what they said. They should have run her out, but were just a little too nervous for it, so they poked at her life instead.The grocer's wife gave her the older batch of bread. The grocer's daughter raised an eyebrow as she bought seeds for birds, bones for stray dogs. The retired gentlemen, with war medals on their jackets, stepped deliberately in her path as she rode through town, so that she almost tipped off her bicycle, trying to avoid them. The women did not talk to her, not even when she smiled that deep, longing smile and said please, how kind. They snickered as she left their shops. After all, there was nothing worse than a witch. Your words painted pictures in my mind. Like a dream, yet not. We get it - and still relate apparently! You're working up a nice collection of short stories here, lovely and at the same time very perceptive. Pia, you are so lovely <3 Thank you for warming my heart with your comments.